The bucolic Town of Hartford, New York is home to artist Janine Thomas. Having honed her skills as the art teacher at the Hartford Central School for many years, she established “Crowfield Studio and Gallery” in 2002. Janine Thomas represents the people, places, and pets inhabiting rural Washington County and the Adirondack foothills. Her realistic images combine classic background tones to create visual works that isolate the unique qualities of chickens, sheep, horses, cows, farm families and 4H kids. Her chickens have become her agrarian trademark. 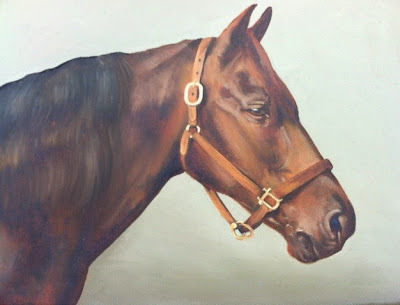 Saratoga images of race horses and riders are becoming a favorite expression in the oil medium. Realistically rendered jockeys on their mounts emerge out of muted backgrounds combining the dream of racing with the power needed to win. Having owned four morgan horses, the breed features prominentally in portraits of show horses, driving horses and riders. Her work has been shown at Gardenworks, Salem, N.Y., McCartee’s Barn”, Salem, N.Y ., “Sweet Pea Perennial Farm and Gallery”, Bolton Landing, N. Y. Landscapes for Landsake 2013 , Cambridge, N.Y., She currently exhibits her paintings at Saratoga Signatures, Saratoga Springs, N. Y., Stockade Imports, Saratoga Springs, N.Y. and Front Street Home, Ballston Spa, New York. Janine Thomas is a member and past president of the Guild of Adirondack Artists. She has had numerous one woman shows and is included in many private collections. She is also a docent at the Hyde Museum in Glens Falls,NY, BOCES board member and is vice-president of the Board of Education of the Hartford Central School.